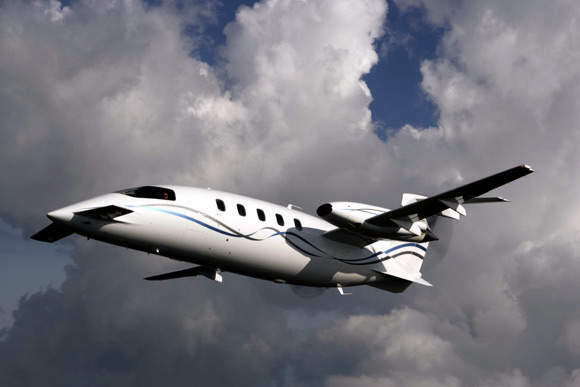 The Piaggio P180 Avanti II twin-engine turboprop business aircraft is the successor to the P180 Avanti. The Avanti II was certified by the European Aviation Safety Agency (EASA) in October 2005 and is scheduled to enter service in early 2006. The Avanti II introduces enhanced avionics, higher performance in terms of speed and payload and a higher level of cabin comfort. 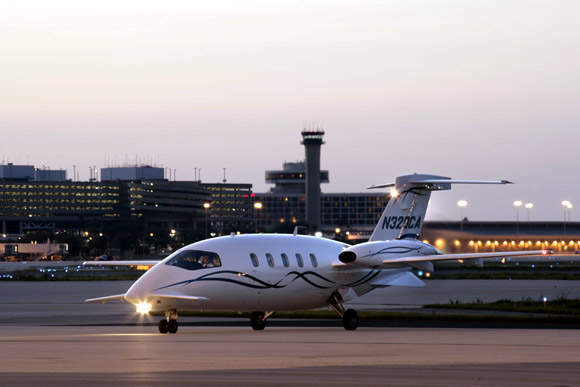 The Avanti II has a maximum operating speed of Mach 0.70 and seats up to nine passengers. 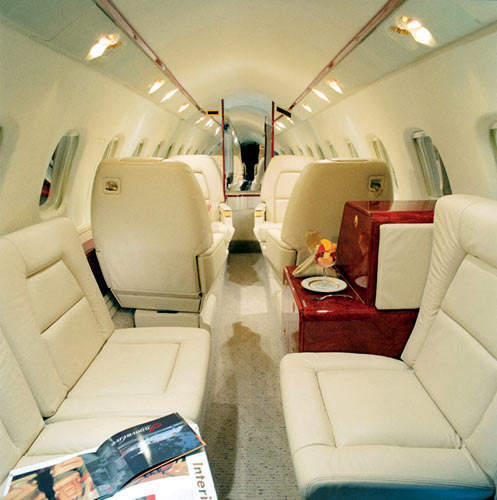 The spacious interior of the Avanti II cabin. The pusher engines of the Avanti II direct sound toward the tail of the aircraft, minimising engine noise. The Avanti II avionics are based on the Rockwell Collins Pro Line 21 suite and include three 10in by 8in liquid crystal displays. 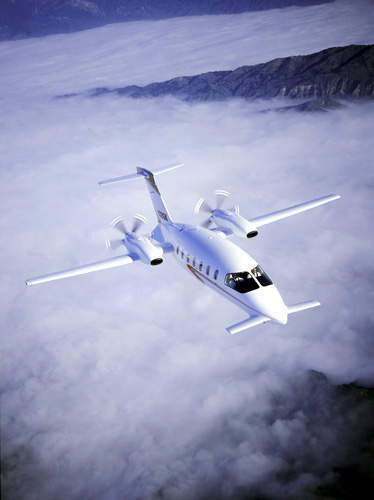 The Piaggio P180 Avanti II twin-engine turboprop business aircraft is the successor to the P180 Avanti, of which more than 100 have been produced since its entry into service in 1990. P180 Avanti II was displayed at the 2010 AirVenture held between 26 July 2010 and 29 August 2010. Avanti II was certified by the European Aviation Safety Agency (EASA) in October 2005 and the first aircraft was delivered to a private customer in Switzerland in December 2005, to enter service shortly after. The aircraft received US FAA certification in March 2006. The P180 Avanti II was accredited with ANAC certification by the National Civil Aviation Authority of Brazil in November 2010. Orders have been received for more than 120 Avanti II aircraft. The 50th Avanti II was delivered in October 2008. The P180 Avanti II has a maximum operating speed of Mach 0.7. The aircraft is certified for single-pilot operation and seats up to nine passengers. Avanti II introduces enhanced avionics, higher performance in terms of speed and payload and a higher level of cabin comfort. The operational ceiling of the Avanti II is 41,000ft allowing the aircraft to fly above weather systems. 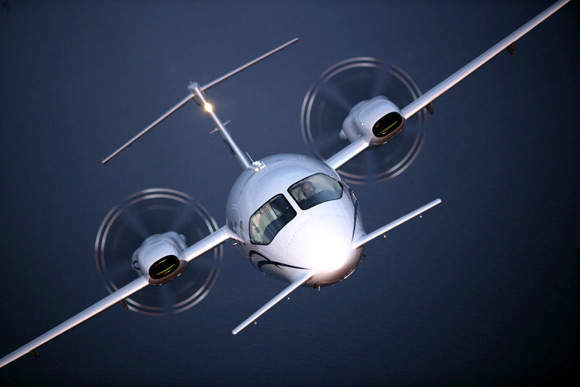 The aircraft are constructed at Piaggio Aero’s manufacturing facilities in Genoa, Italy. Piaggio America, Inc. based in West Palm Beach, Florida, completes, delivers and supports the Avanti aircraft in North America. "Piaggio Aero sold two P180 Avanti II aircraft to an undisclosed customer at the Singapore Airshow in 2012. The aircraft will be delivered in Beijing in July 2012." Piaggio America and Avantair signed a contract in November 2005 for 36 Piaggio Avanti II aircraft. The first five were delivered in December 2006. In March 2007, two P180 Avanti II aircraft were delivered to the Italian Guardia di Finanza border patrol agency. Blue Panorama, an Italian airliner, ordered two P180 Avanti II aircraft in May 2009. The UAE Air Force and Air Defence acquired two P180 Avanti IIs in June 2009, as part of its expansion programme. Aviacharter, of Russia, became the first customer in the country to sign a letter of intent to purchase two P180 Avanti II aircraft after it was certified by the Russian regulatory bodies. Susi Air of Indonesia ordered two P180 Avanti II aircraft in February 2010 at the 2010 Singapore Airshow. The first P180 Avanti II aircraft was delivered to ENAV in March 2009, while delivery of the second aircraft took place on 16 April 2010 at Ciampino Airport. Piaggio Aero sold two P180 Avanti II aircraft to an undisclosed customer at the Singapore Airshow in 2012. The aircraft will be delivered in Beijing in July 2012. The Civil Aviation Administration of China (CAAC) certified the P180 Avanti II in October 2011. The uninterrupted aerodynamic curve shape from nose to tail gives decreased drag and improved laminar flow for efficient and high-performance flight characteristics. The aircraft has three separated lifting surfaces which support stability. It also has two-thirds of the conventional surface area, which also makes a major contribution to reduced drag and increased fuel efficiency. The forward wing provides additional lift to push the nose of the fuselage upwards rather than using a conventional aerodynamic configuration which forces the tail down. The T-tail provides stability. 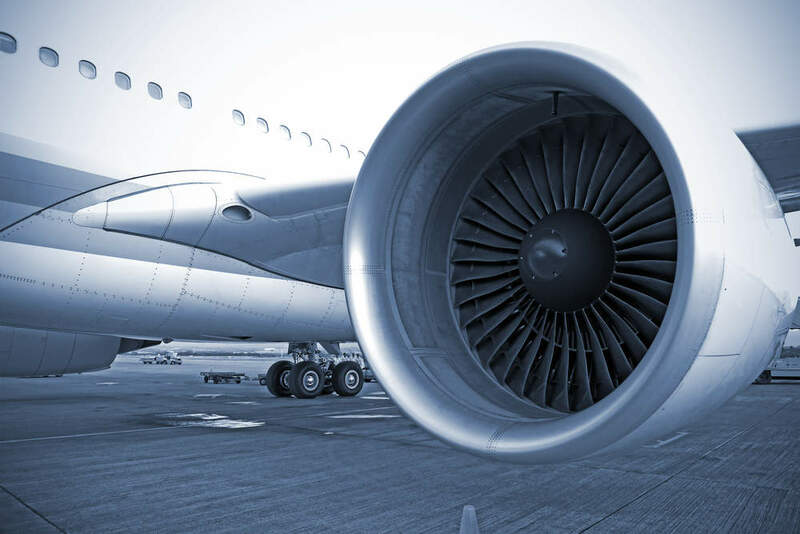 About 90% (by weight) of the aircraft is aluminium alloy and about ten percent are composites, including carbon fibre-reinforced plastic for high-stress areas. The construction method starts with shaping the aluminium skin in a vacuum mould and then sequentially fabricating the aircraft in layers. The pilot and co-pilot have adjustable and reclining seats. The Avanti II avionics are based on the Rockwell Collins Pro Line 21 avionics suite and includes three 10in by 8in liquid crystal displays, an FMS 3000 flight management system and AHS 3000 attitude heading reference system. The radar and navigation systems include the Collins WXR-840 colour radar and a dual Collins VIR-32 VOR, a Collins ADF-462 automatic direction finder, DME-42 distance measuring equipment and ALT-55B radar altimeter. The spacious cabin is 1.75m high and 1.85m wide and is fitted with five fully-adjustable cabin leather chairs and a divan. The Avanti II cabin is rated at 68dbA speech interference level. The pusher engines direct sound towards the tail of the aircraft, minimising engine noise. The combined design of the wing, engine and fuselage provides a significant reduction in vibration for passenger comfort. With a 9psi differential, the Avanti II’s cabin maintains sea-level pressure up to 24,000ft. Engines are mounted above the wing in all-composite nacelles manufactured by Moreggio. 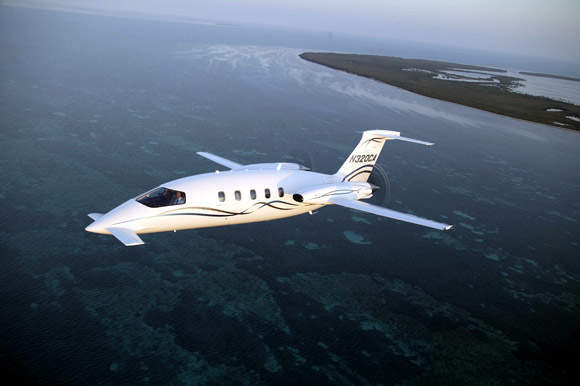 "Piaggio America and Avantair signed a contract in November 2005 for 36 Piaggio Avanti II aircraft. The first five were delivered in December 2006." The Pratt & Whitney Canada PT6A-66 turboprop engines are rated at 634kW. The engines drive Hartzell five-bladed, constant-speed, fully feathering, reversible-pitch, rear-facing push propellers. The position of the propellers removes the drag of propeller vortices on the wings. Pratt & Whitney PT6-66B engines were introduced in 2006. The engines offer a 12kt increase in the cruise speed to the maximum of 398kt at altitudes in excess of 35,000ft. The two fuselage tanks and two wing tanks hold a maximum of 1,585l of usable fuel which gives a maximum range of 3,322km, allowing the completion of most corporate missions without refuelling. A flight from London to Athens or Paris to Moscow will take less than four hours. A 570km (300-mile) journey can be completed in 53 minutes. The aircraft is fitted with Dowty hydraulically retractable tricycle-type landing gear with a twin-wheeled nose unit and single-wheeled main units. The wheels are fitted with Goodrich hydraulically activated multidisc carbon brakes. 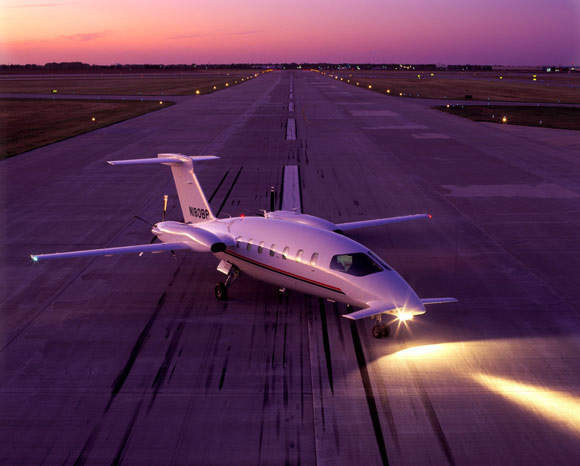 The short field performance of the aircraft – 869m take-off distance over 50ft obstacle and 872m landing distance over 50ft obstacle – allows the Avanti to fly to smaller airfields close to a wide number of destinations. The P180 Avanti II can climb at the rate of 14.98m/s. The maximum and cruise speeds of the aircraft are 732km/h and 593km/h respectively. The range is 2,592km and the service ceiling is 12,500m. The aircraft weighs around 3,402kg and its maximum take-off weight is 5,239kg.